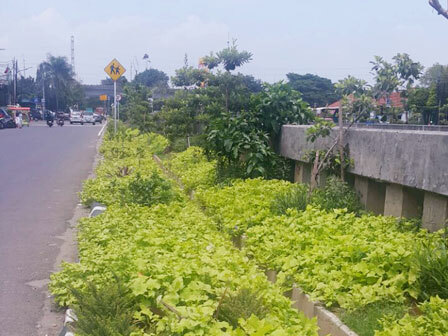 Sentiong Riverbank in Kemayoran Sub-district, Central Jakarta is planted with various crops. Not only to make it beautiful, green spaces are created to prevent street vendors (PKL) from selling on the riverbank.
" In a week ahead, we want no more vacant land on Jalan Inspeksi. All must become green"
"In a week ahead, we want no more vacant land on Jalan Inspeksi. All must become green," said Hery Purnama, Central Jakarta Kemayoran Sub-district Head, Thursday (4/12). According to him, green spaces on the left and right sides of Sentiong River's Jalan Inspeksi are not optimal yet since it is only planted around 50 percent. Especially in Harapan Mulia Urban Village from Galur intersection to Mada Bridge.Then in Utan Panjang Urban Village from Mada Intersection to Jalan Haji Jiung and in Kebon Kosong Urban Village from Bendungan Jago to Dakota Flat. "PPSU personnel and people who care with the environment do all the work. While the crops are obtained from Forestry Sub-dept. and local residents and coordinated by local urban villages," he added. It will be planted with ornamental crops such as pucuk merah, tuber crops, grass, and others. He hopes by planting those crops, the area becomes greener and beautiful.